If you are looking for information on the Just Moulding franchise business opportunity, Just Molding franchises or Just Moulding franchising, then you have come to the right place. 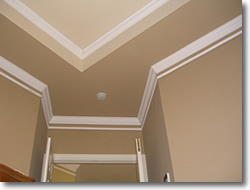 Just Moulding Is A Niche Concept In The In-Home Service Industry Segment. We specialize in the custom design and installation of interior mouldings including crown moulding, chair railing, wall frames, coffered ceilings, tray ceilings, shadow boxes, and wainscoting. Our unique production process offers clients a superior product at a lower cost. How do we do it? Instead of cutting and fabricating materials onsite in your home, we perform most of this work in our shop. By using sophisticated measurement technology in your home and advanced tools in our warehouse, we provide clients with the highest quality product and a streamlined installation. Our innovative approach also enables us to complete smaller jobs at a lower cost - projects otherwise unprofitable for most contractors. Just Moulding was established in 2006 with a concept conceived by partners Kevin Wales and Mark Rubin. They invested their own money and developed the entire process together to create a unique business model. 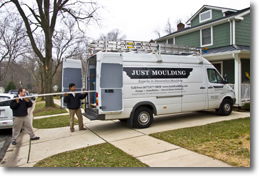 Just Moulding began franchising in 2008. We Are Experienced Franchise Owners Ourselves! If you are considering a future with your own home improvement franchise or home décor franchise, think about becoming a Just Moulding franchisee. Our crown moulding franchise offers the perfect way to showcase your home improvement craftsmanship. Guidance on "setting up shop"
Experience A New Dimension In Home Improvement!